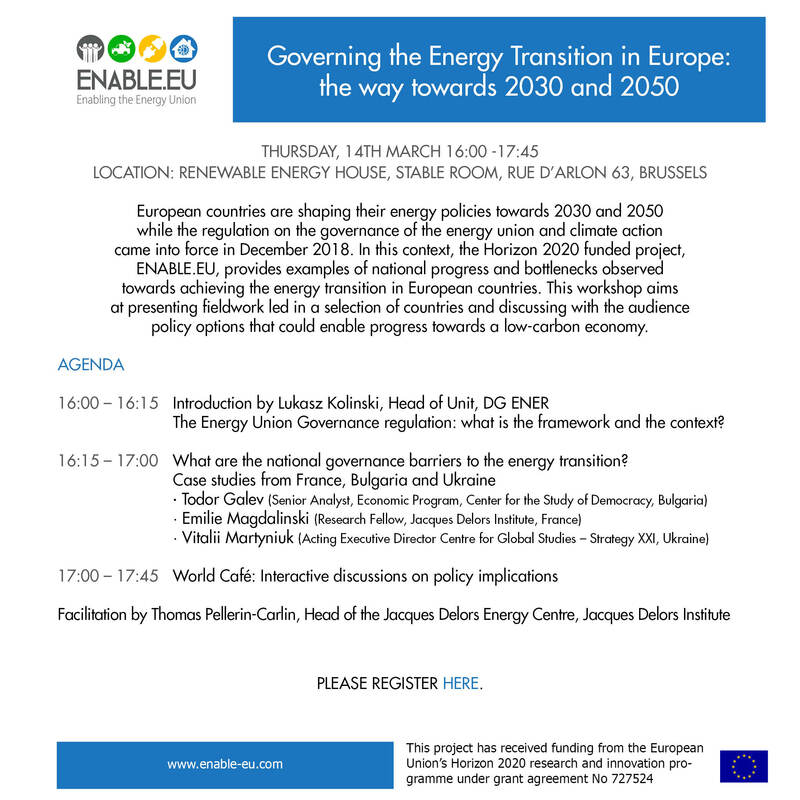 On 14 March 2019, ENABLE.EU held its first policy workshop on “Governing the Energy Transition in Europe: The Way towards 2030 and 2050” at the Renewable Energy House in Brussels. The workshop, which gathered about 30 participants, mainly from the energy sector, discussed how European countries are shaping their energy policies towards 2030 and 2050 and explored the main governance bottlenecks slowing down the energy transition. Presentations and debates were moderated by Thomas Pellerin-Carlin from the Jacques Delors Institute. 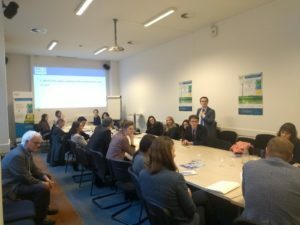 Lukasz Kolinski, Head of Unit at the DG Energy of the European Commission, gave an overview of the regulation on the governance of the energy union and climate action that came into force in December 2018. By assessing the credibility and complementarity of national energy policies, the EU aims to ensure the delivery of the 2030 targets. Furthermore, the European Commission November 2018 Communication called for the EU to build a climate neutral economy by 2050 to achieve the ambitions of the Paris Agreement. To do so, all Member States will develop and present their long-term strategies. While the Europeanisation of energy decisions shows the progress made in achieving the energy transition, some governance barriers still remain in European countries. Todor Galev (Center for the Study of Democracy, Bulgaria), Emilie Magdalinski (Jacques Delors Institute, France) and Vitalii Martyniuk (Centre for Global Studies – Strategy XXI, Ukraine) presented the results of field work conducted in Bulgaria, France and Ukraine. 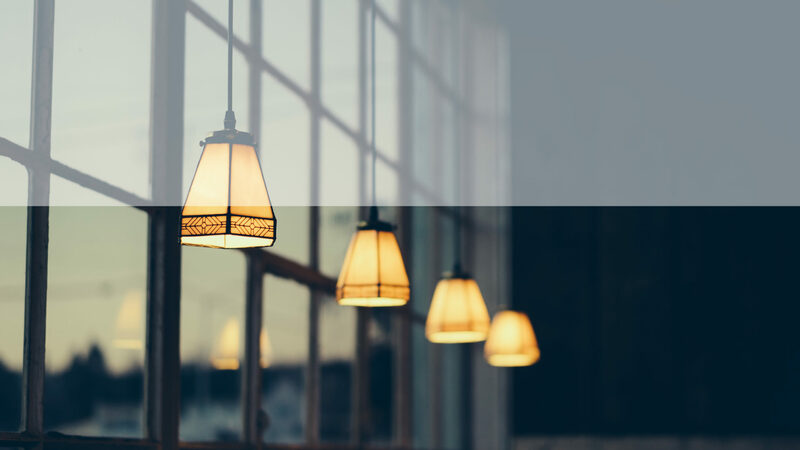 A synthesis case study report with policy recommendations assesses governance bottlenecks and their impact on collective energy choices. The nine national case study reports (Bulgaria, France, Germany, Hungary, Norway, Poland, Serbia, UK and Ukraine) can also be found in the deliverables section of the ENABLE.EU website. Following the presentations, participants were invited to reflect on this topic and to work in groups. 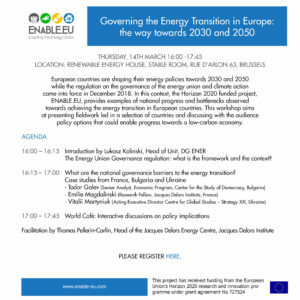 They identified three main bottlenecks that hinder the energy transition in Europe: the lack of public acceptance, vested interests tempering the ambition of national policies and a fragmentation of regulatory policy at the national level. 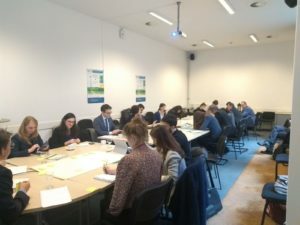 Policy options that could enable progress towards a low-carbon economy mainly focussed on designing incentives for citizens to change behaviours and become more active (e.g. engage in local cooperatives), for industries to adopt measures to be more aligned with the energy transition, and for ensuring better coordination between local and regional authorities.